Physical health and mental health are inextricably linked together. Moreover, as the biology of mental illnesses is gradually – and inexorably – being elucidated, the overlap between physical illnesses and mental illnesses has become even more apparent. These observations ‘set the stage’ for readers of this issue of Psychiatric Clinics in which a variety of articles are presented from all aspects of medicine - from emergency mental health to how burn patients heal and cope with the physical and mental outcomes, to coverage of issues such as prolonged stay in the intensive care unit, comorbidities in the elderly, food allergies, depression and other common primary care conditions, and childhood diabetes. A primer on interviewing techniques and role play is presented along with the role of nurses who cross both mental and physical aspects of healthcare and the essential role of a supportive family to the interdiscipinary team . Peter F Buckley, MD, is Professor and Chairman in the Department of Psychiatry at the Medical College of Georgia in Augusta. He immigrated to America in 1992 after completing his medical degree and post-doctoral training at the University College Dublin School of Medicine in Ireland. His thesis was on the subject of neuroimaging and neurodevelopment in schizophrenia. 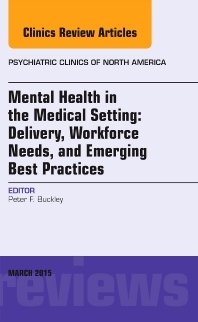 Before joining the Department of Psychiatry at the Medical College of Georgia, Dr Buckley was Professor of Psychiatry and Vice Chair in the Department of Psychiatry at Case Western Reserve University School of Medicine in Cleveland, Ohio and served as Medical Director at Northcoast Behavioral Healthcare System (NBHS), the adult state psychiatric services for Cleveland and Toledo, Ohio. Dr Buckley conducts research on the neurobiology and treatment of schizophrenia. He is author of a textbook on psychiatry and has edited eight specialist books on schizophrenia, as well as publishing widely in major psychiatric journals with over 250 book chapters, articles and abstracts. Dr Buckley is also Editor-in-Chief of the Journal of Dual Diagnosis and is on the editorial board of five other journals. He is recipient of several awards for his work, including an Exemplary Psychiatrist Award from the National Alliance for the Mentally Ill. Dr Buckley is also the recipient of the 2004 American Psychiatric Association Administrative Psychiatric Award.